Did you know that 51% of shoppers say that they use mobile devices to find new brands and products? Since “smart” mobile and portable devices came onto the scene they have been steadily taking traffic from desktops. So why do mobile conversions still underperform desktop conversions? Well, there are a few reasons. Some of those reasons, like shopper concern about the safety of their information, you have little control over. One of the reasons mobile conversions still lag behind desktop conversions you have complete control over: your mobile landing pages. A landing page is a single web page that shows up when clicking on a search result or online ad. 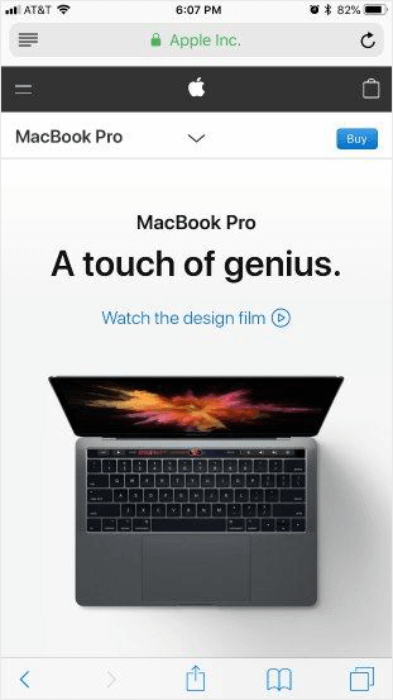 These pages typically have a single call to action or purpose and minimal design and navigation. In this article, we’re going to walk you through 15 mobile landing page best practices that will boost your mobile conversions. We’ll wrap up with some mobile landing page examples that will inspire you to create your own. The best mobile landing pages grab attention, demand an action, and get a conversion. Done and done. 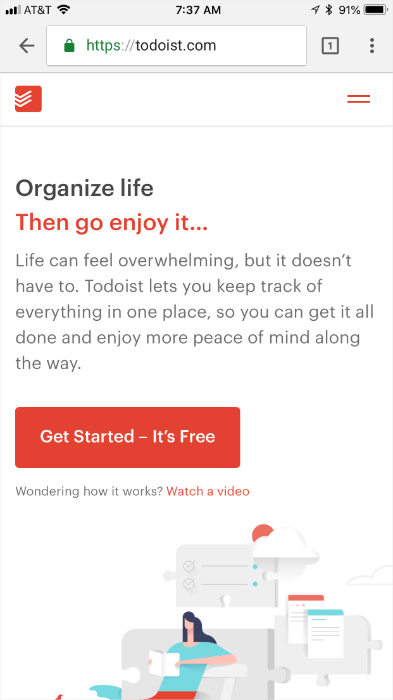 When you find yourself on a well-crafted mobile landing page something inside of you probably sighs happily because it just “feels” right and is oh-so-easy to use. You can make your own landing pages just like this with these 15 mobile landing page optimization tips, so let’s get into it. It’s not enough to be “mobile first” or “responsive” anymore. Your mobile landing pages have to be designed specifically for mobile use or they aren’t going to convert the way you want them to. The problem with responsive design is that all of the elements were still designed for desktop, not mobile. Even the flow of the page was created for desktop use. Since mobile users search and browse sites differently than desktop users, your landing pages need to be customized for each device that will be used throughout the customer’s journey. It’s important to map out the customer journey and build your site optimized to the devices that will be used along the way. 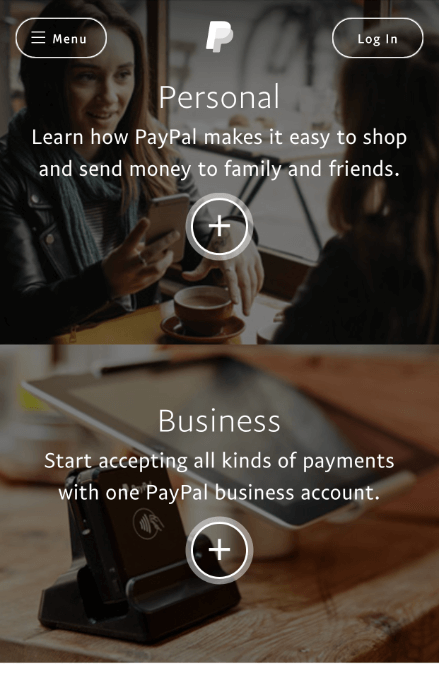 PayPal does a great job at creating an entirely different experience for mobile and desktop users. 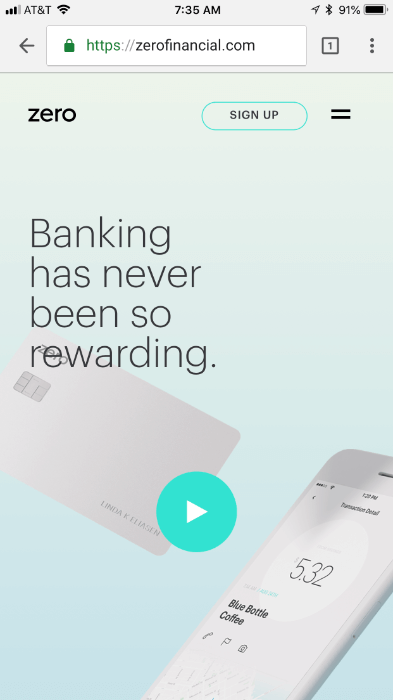 Their desktop landing page, while still minimalist, is visually engaging and appealing. Their mobile landing page is very simple. 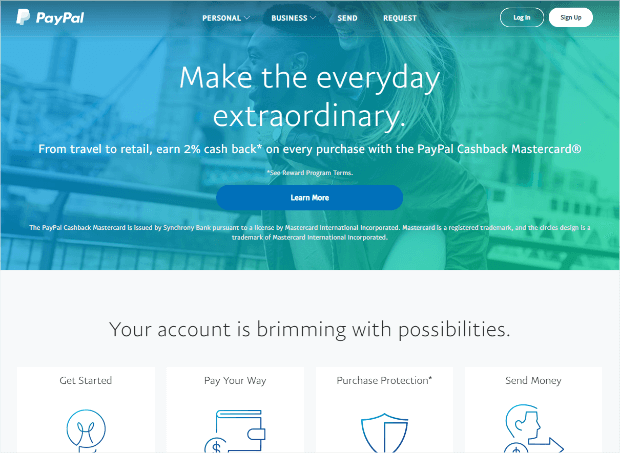 There’s an option to login and a menu in case you want to see additional options, but the primary focus is two buttons that will take you to more information about using PayPal for personal use or business use. 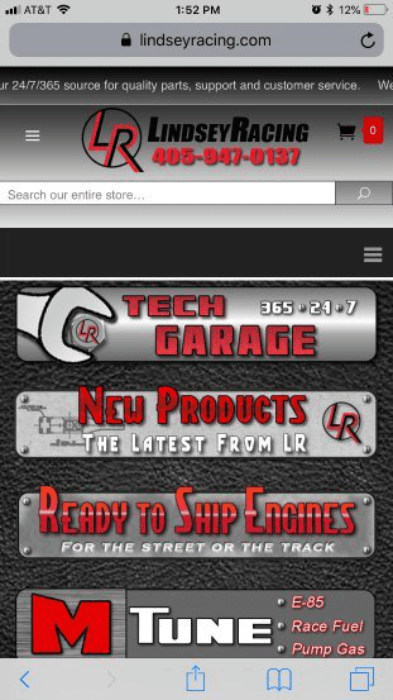 This eliminates the need for a mobile visitor to scroll through the site to find the information they’re looking for. 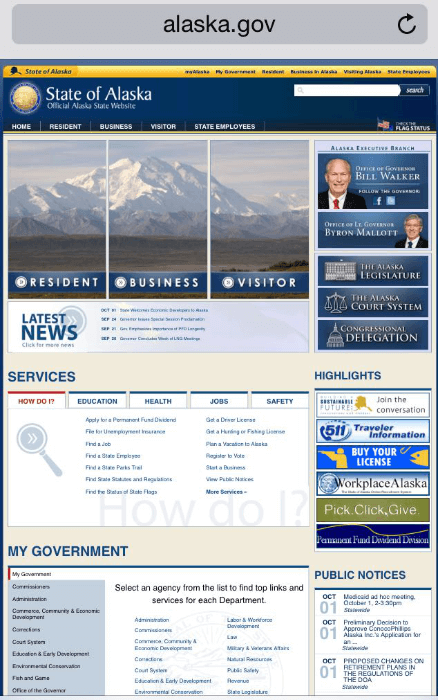 As you can see, both landing pages are visually appealing and both handle very different visitor needs. The mobile landing page is built to help visitors find information or complete tasks quickly while the desktop landing page is geared more towards visitors with time to spend. If key data like inventory, business hours, and pricing isn’t going to be easily accessible on your site, your contact information needs to be. For a mobile site, this means using a click-to-call button that’s easy to spot and big enough to click. Mobile users are interested in getting the data they’re looking for right now. If they can’t find it quickly on your site they will look for an easy way to contact you to get the info they need. Check out how to get more calls from your website and get those visitors the info they need to make the connections and sales you want. Most of the time a shorter landing page is better. There are times, however, that users will want to browse through your inventory or read something on your site. In these cases, you can use click-to-scroll. Click-to-scroll means that you set up navigation buttons that a user can click to take them to a longer, scrolling page. Rather than forcing scrolling on your site’s visitors, you allow them to make the decisions. String Automotive did their own A/B testing for their mobile landing page and found that adding click-to-scroll functionality reduced their bounce rate by 37%. Even though screen real estate is precious on mobile landing pages, it’s important to keep your call to action or whatever navigation you’re using for your mobile landing page easily accessible. Sticky navigation lets visitors find what they’re looking for about 22% faster, which is a big deal for mobile landing pages. Also, literally everyone prefers sites with sticky navigation, even when they can’t explain why. 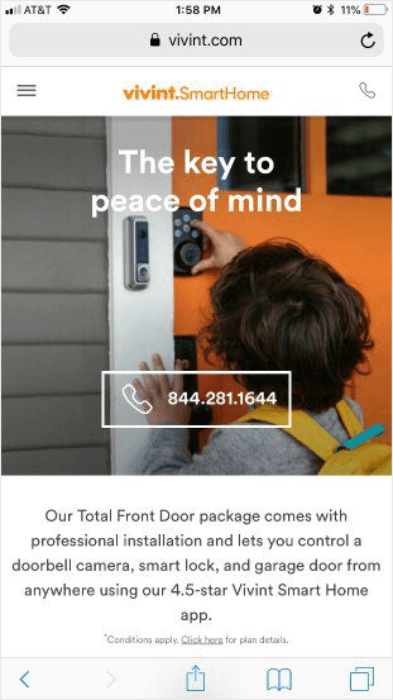 Popups can be useful and effective for lead generation on mobile landing pages if you make sure that they’re optimized for mobile. A big part of that optimization means keeping them as simple as possible, so limit your form to just a few fields or even just an email address. You can always reach out to the visitor at the provided email address for more information later. The popups used for mobile should match your mobile landing page size and not be a burden for the visitor to close or opt out. 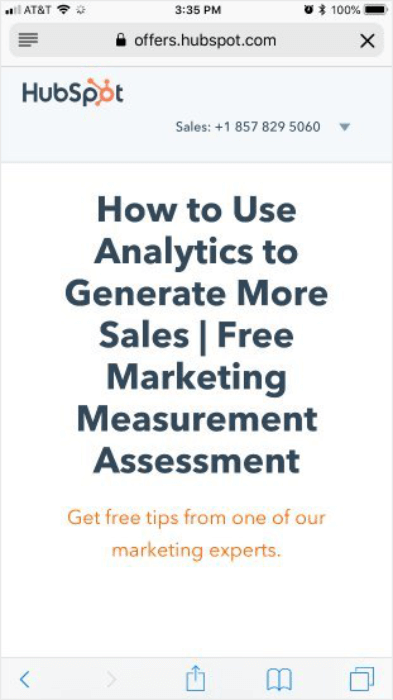 When used correctly popups are an awesome addition to your conversion rate optimization strategy. Your mobile landing page shouldn’t contain all of the copy from your desktop site. This is a place to use shorter, abbreviated copy. You can and should still be clever and colorful, but you’ll want to get to the point quickly or your visitors will get frustrated with you and leave. The goal is to be brief and succinct, not to cut out key points that will make or break your message. If something adds value, leave it. Bullet points are great for getting key points across in smaller chunks without having to use supporting copy around them. They also have the added benefit of drawing the visitor’s eye, making them less likely to be overlooked. Sentences and paragraphs should both be short and easy to read. There should be no walls of text on your page. Breaking up the text keeps the visitor interested and makes it easier to find key points. Images and videos take data. Not all users reaching your mobile landing page are going to be on WiFi; some will be using their limited cellular data. Keep images to a minimum and be sure to optimize the images you do use to ensure that they’re compressed. If you’re going to be using videos you definitely don’t want them set to auto-play. This means that your visitors will have to click them to play them, which could distract them from your primary call to action. Sure, it’s a very pretty page, but it’s filled with images and is entirely too resource-intensive to load. 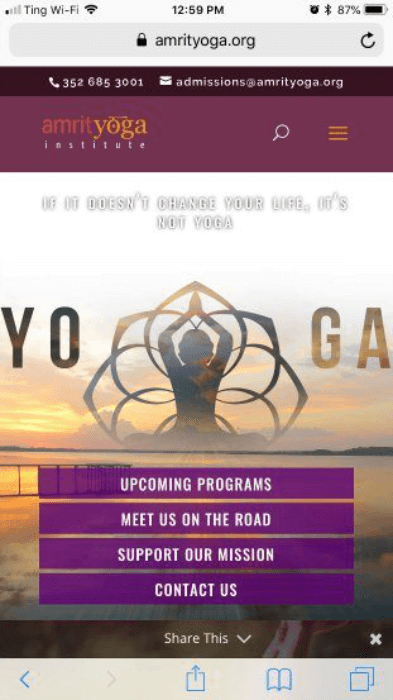 Amrit Yoga could’ve conveyed the peace and calm of yoga just as well with a minimalist design using limited images and ended up with a site that loaded much faster. 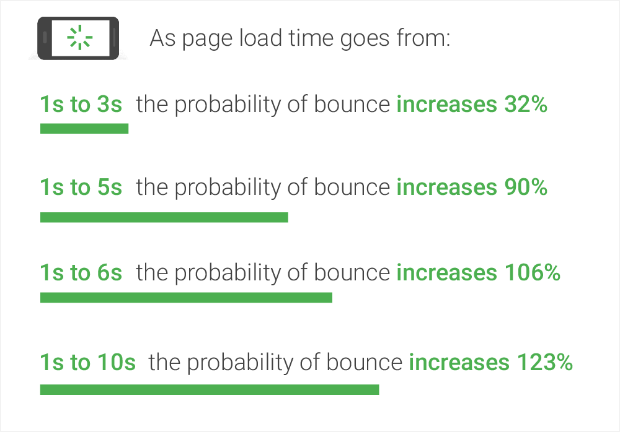 Paying attention to load times is super important because as page load times increase, bounce rates also increase. And, when a visitor leaves a site because of slow load times, almost 50% of them never come back. Interestingly, the average time it takes to fully load a mobile landing page is 15 seconds. When you consider that 53% of mobile site visitors will bounce if a site takes longer than 3 seconds to load, the average site takes far too long to load. If you took note of the advice in the previous tip then your site should already be loading faster since images and videos tend to be the number one problem with slow sites. You can also upgrade your hosting plan to a faster one, or look into a Content Delivery Network (CDN) like MaxCDN. Mobile devices don’t need multiple columns. They don’t have room for them and anything more than a single column makes navigation and scrolling feel really cumbersome and clunky. Of course, rules are also made to sometimes be broken. If you are trying to catch visitor’s attention it may be beneficial to occasionally misalign content. For the most part, however, single-column is the way to go. 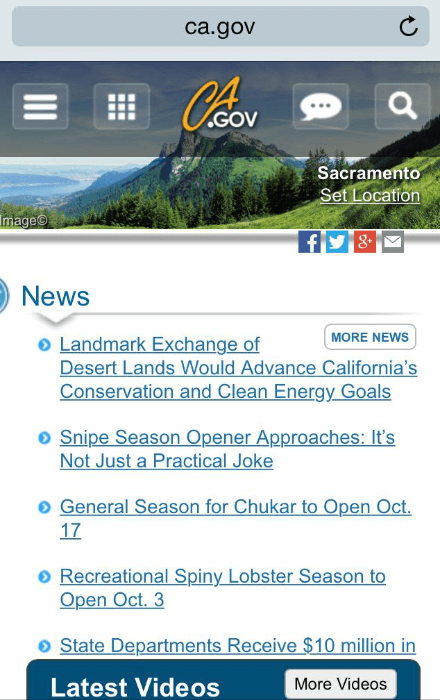 The multiple columns that work on a regular webpage just do not work on a mobile site. Can you imagine how difficult it would be to navigate this site in a space of about 3X5 inches? Not super exciting, but definitely much easier to use. Did you know that some marketing thought leaders think that we should do away with navigation altogether on mobile landing pages and focus on pushing visitors toward the primary call to action that we want them to complete on the page? Many mobile landing pages use a “hamburger” for navigation to save space on smaller screens. Most visitors have grown used to seeing this symbol and know that clicking it will bring up navigation options. 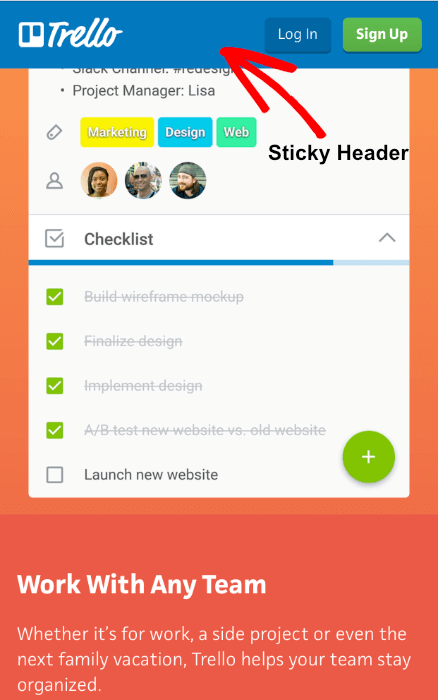 Some sites use the sticky headers that we talked about in #4 to include a couple of main navigation links that are related to the primary goal they have for the mobile landing page. 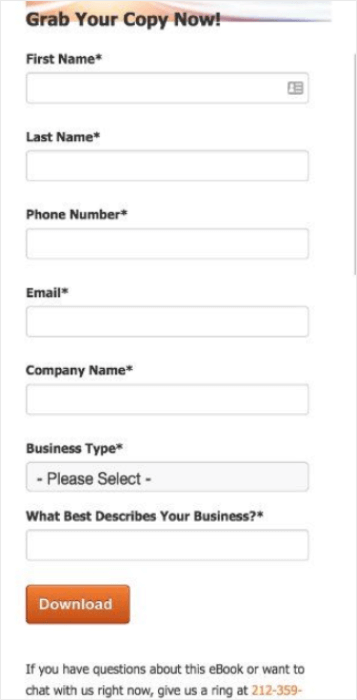 It is so very important that you optimize your forms for mobile visitors. Filling out forms on a mobile device actually has a negative net fun value, so make sure that you get the bare minimum information you need to accomplish your goal. You can always follow up later for more information. Quick Tip: If you have a WordPress site, you can use a plugin like WPForms to help you quickly and easily build forms that are going to work beautifully for your mobile visitors. They set you up with what they’re offering. It’s a little wordy, but the form makes up for it. Three fields: first name, email address, and a dropdown to select the instrument you play. Boom. 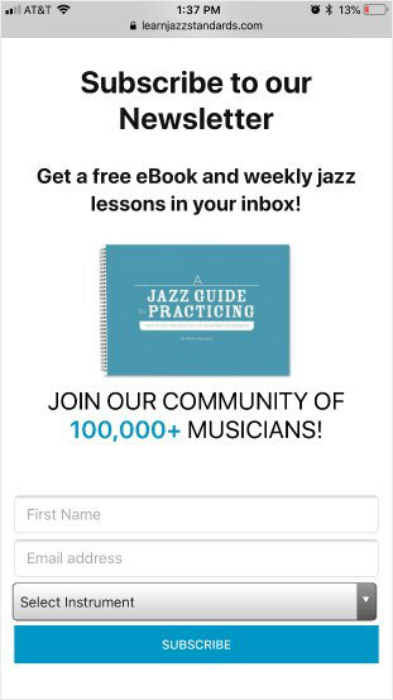 Click subscribe and you’re on your way to learning jazz standards. Likeable Local is another story entirely. We’re sure they’re lovely, but we’re not sure we like them enough yet to spend the time it’s going to take to fill out 6 text fields and a dropdown on a mobile device before we can download their lead magnet. If you need help crafting just the right optin, check out this post all about how to create mobile optins that win more business. High contrast colors serve a two-fold purpose for mobile landing page optimization. First, they’re eye-catching and even people who don’t have the design bug can sometimes find beautifully designed buttons irresistible to click. Second, people use their mobile devices everywhere and natural outdoor light can make it hard to see what’s on the screen if it’s a low-contrast design. 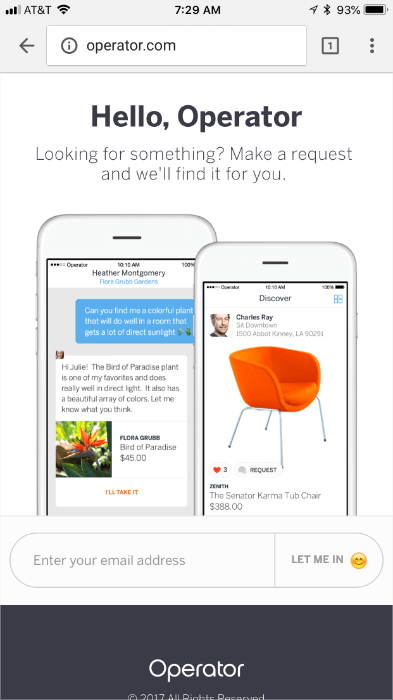 Apple does an excellent job a using high contrast with darker text and images on a bright white background. The black, grey, and red design looks edgy which we assume is what they were going for, but everything just turns into mush under harsh light. You want to make sure that you’re using colors that convert well and that show up under whatever type of lighting your visitors happen to be using. 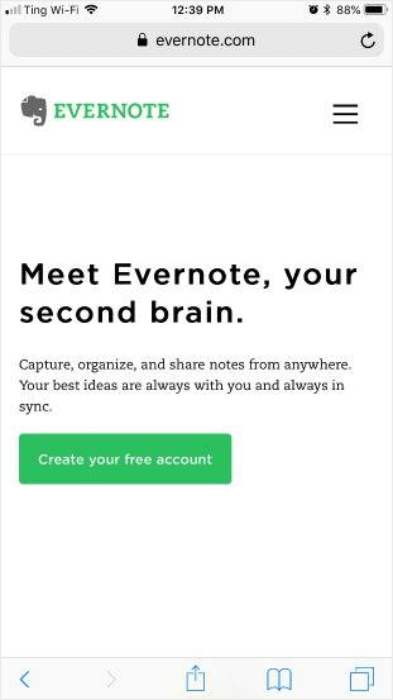 As we’ve already seen with Evernote and Apple, the use of white space is a wonderful thing. It creates interest and makes the mobile landing pages look modern. It also gives the eyes room to read the words that are on the page. White space also makes touchscreen interactions easier for visitors and keeps accidental clicks to a minimum. For a creative take on white space let’s take a look at SquareSpace. Squarespace’s white space shows that white space doesn’t really mean “white” space. 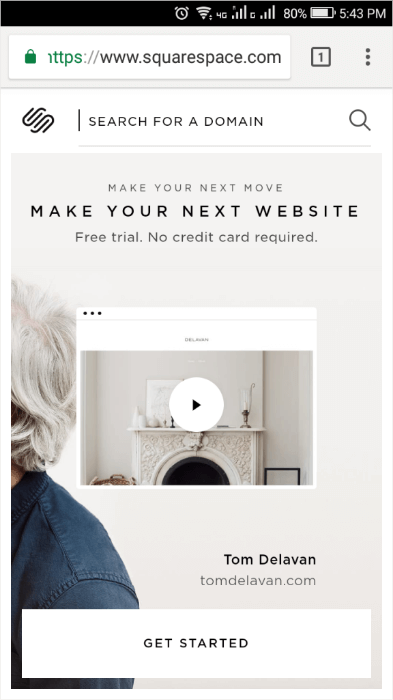 We’re looking for white as in “free from distraction.” SquareSpace does this beautifully. “Above the fold” still applies to mobile landing pages. Yes, mobile users are conditioned to scroll, but 80% of a mobile visitor’s attention is still spent at the top of the page, before the first, instinctual scroll. This is where your primary call to action needs to be. 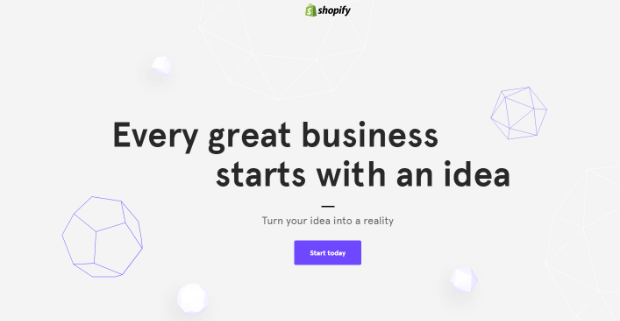 Drift does a great job of keeping their call to action toward the top of the page and draws attention to it with a little color changing action. They’ve since changed this cool feature, but we wanted to use it here to show you what can be done. As you scroll down Drift’s page you get the same call to action (without the colors) about midway to remind you why you’re there. If you’re unsure about what makes a great call to action, we can help you create the perfect call to action. 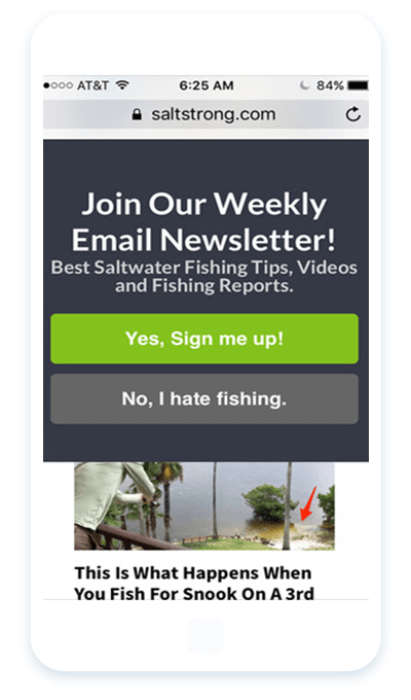 We saved the most important mobile landing page best practice for last: A/B testing. You will get so much information that you can use to make your site better, increase conversions, and boost your revenue just by making subtle changes. Decide what issue you want to solve, such as increasing conversion rates. Determine what you want to compare; for example, would 10% off convert better than free shipping? Perform the test by creating two versions of the landing page, the only difference being the item you want to compare. Figure out the winner by analyzing your data and reviewing the results of your A/B test. Revise and re-rerun your experiments. There are literally thousands of ways to break apart your site to split test it. For some ideas, take a look at this post of 11 best practices for A/B testing. Now that you’re an expert on designing and testing, let’s look at some mobile landing page examples, shall we? You’ve already seen some of our favorites in the examples above, but here are a few more of the best examples we’ve found. There you have it! 15 mobile landing page best practices and optimization techniques to boost your conversions and engagements on mobile. If you’re looking for more ways to increase your mobile conversion rate, check out these 19 proven methods. Want to try your hand at creating a landing page? Check out our tutorial to create a simple landing page in under 5 minutes! 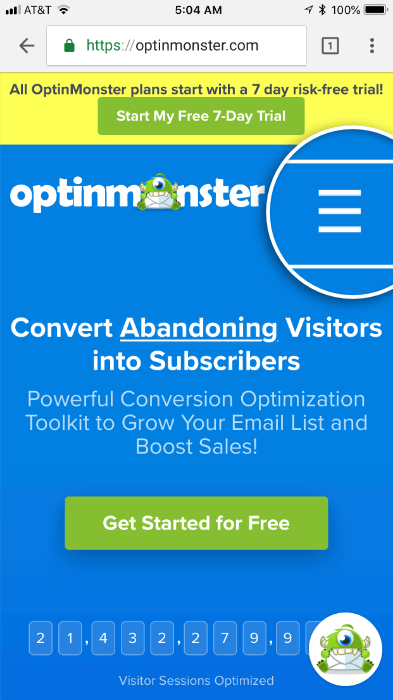 OptinMonster can be the lead generation partner you’ve been looking for. Join us today. What are you waiting for?